Long-range flood forecast is very challenging over monsoonal regions. 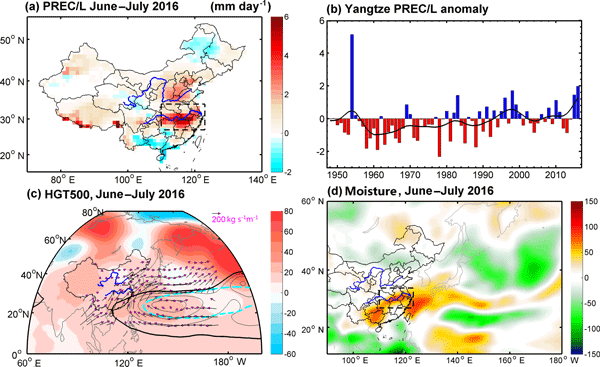 We investigate the potential of extending seasonal predictability of Yangtze River summer floods by using atmospheric moisture flux prediction with a perfect model assumption. The finding suggests a potential to use atmospheric moisture flux which is more predictable than precipitation at the seasonal timescale, to improve flood forecasting and early warning, especially during post-El Niño summers. A global data record for all four terrestrial water budget variables (precipitation, evapotranspiration, runoff, and total water storage change) at 0.5° resolution and monthly scale for the period of 1984–2010 is developed by optimally merging a series of remote sensing products, in situ measurements, land surface model outputs, and atmospheric reanalysis estimates and enforcing the mass balance of water. Initial validations show the data record is reliable for climate related analysis. Understanding and forecasting of hydrological drought in the Anthropocene are grand challenges. Human interventions exacerbate hydrological drought conditions and result in earlier drought onset. By considering their effects in the forecast, the probabilistic drought forecast skill increases for both climate-model-based and climatology methods but their difference decreases, suggesting that human interventions can outweigh the climate variability for drought forecasting in the Anthropocene. Large-scale hydrological variability can affect society in profound ways; floods and droughts, for example, often cause major damage and hardship. A recent gathering of hydrologists at a symposium to honor the career of Professor Eric Wood motivates the present survey of recent research on this variability. The surveyed literature and the illustrative examples provided in the paper show that research into hydrological variability continues to be strong, vibrant, and multifaceted. This study evaluated dynamic climate model sub-seasonal forecasts for important precipitation and temperature indices over the contiguous United States. The presence of active Madden-Julian Oscillation (MJO) events improved weekly mean precipitation forecast skill over most regions. 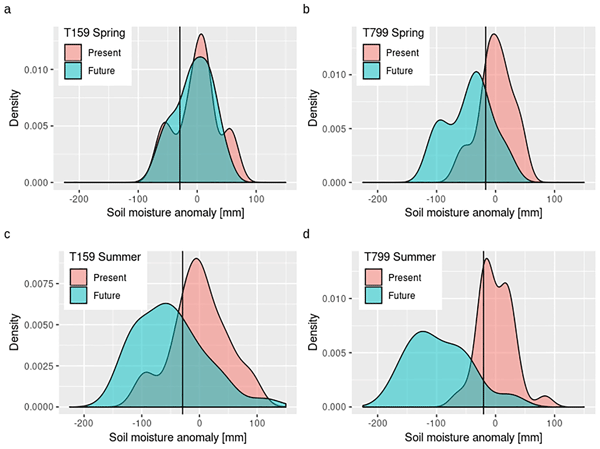 Sub-seasonal forecast indices calculated from the daily forecast showed higher skill than temporally downscaled forecasts, suggesting the usefulness of the daily forecast for sub-seasonal hydrological forecasting. 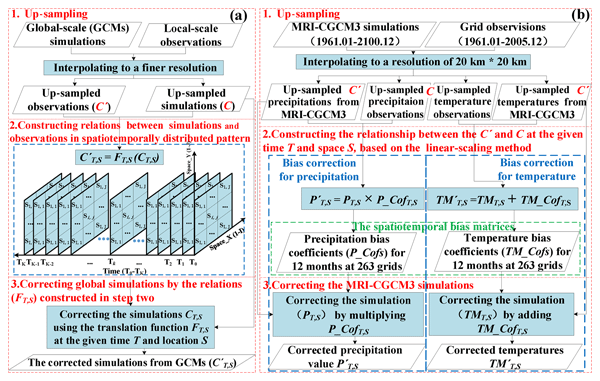 A statistical significance of changes in correlations of daily precipitation in six RCM simulations is assessed. The effect of outliers is explored and a concept of dependence outliers is presented. We show that correlation estimates can be strongly affected by a few outliers; therefore any statistical correction relying on sample correlation can provide misleading results. An exploratory procedure is proposed to detect and evaluate the dependence outliers in multivariate data. 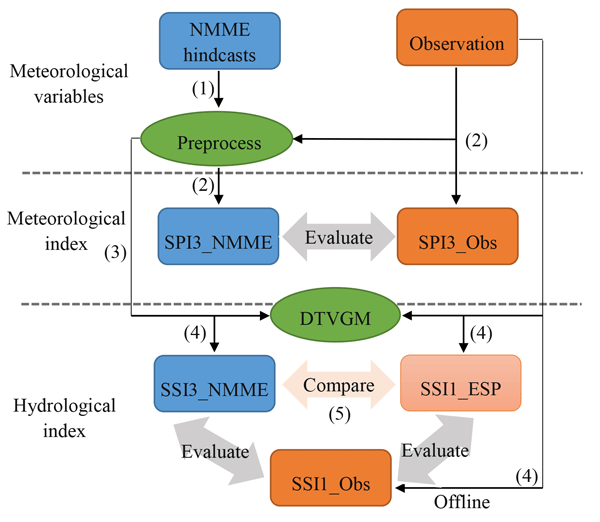 To bridge the gap between the global climate model (GCM) and local climate variables, a spatiotemporally distributed downscaling model was developed. The method was applied to the Poyang Lake watershed to analyze the precipitation changes in the 21th century. The results showed increasing heterogeneities in temporal and spatial distribution under future climate warming. Analyses with temperature increases showed that precipitation changes appeared significantly correlated to climate warming. There are no long-term reasonable rainfall data to build a hydrological model in karst river basins to a large extent. In this paper, the PERSIANN-CCS QPEs are employed to estimate the precipitation data as an attempt in the Liujiang karst river basin, 58 270 km2, China. An improved method is proposed to revise the results of the PERSIANN-CCS QPEs. The post-processed PERSIANN-CCS QPE with a distributed hydrological model, the Liuxihe model, has a better performance in karst flood forecasting. Flood forecasting relies on high-quality meteorological data. 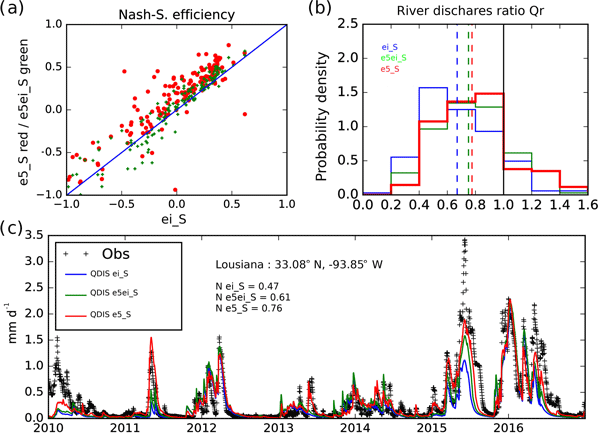 This study shows how improved temperature forecasts improve streamflow forecasts in most cases, with the degree of improvement depending on season and region. 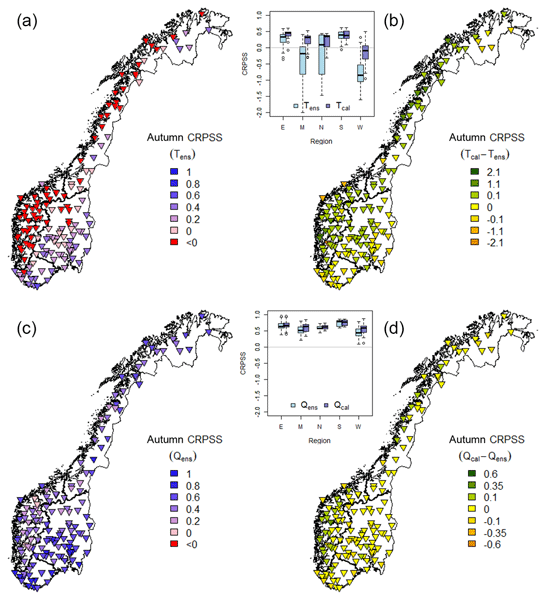 To improve temperature forecasts further, catchment-specific methods should be developed to account for these seasonal and regional differences. In short, for climates with a seasonal snow cover, higher-quality temperature forecasts clearly improve flood forecasts. This paper explains why forecasts of river flow in Europe for a time between 1 and 7 months have skill. The forecasts were produced with a water model. The model reacts to forecasts of weather variables like precipitation, which tend to have little skill and hence hardly contribute to the skill in the forecasts of river flow. The paper shows when and where these forecasts have skill; this is mostly due to knowledge of the amount of water in the soil at the time the forecasts are made. Predicting meteorological droughts more than 2 months in advance became difficult due to low predictability, leading to weak skill for hydrological droughts in wet seasons. Hydrological drought forecasts showed skills up to 3–6 lead months due to the memory of initial hydrologic conditions in dry seasons. 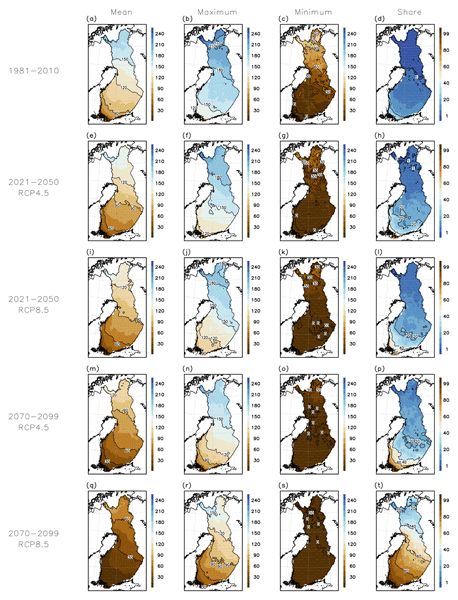 Human activities have increased hydrological predictability during wet seasons in the MHRB. This fills gaps in understanding drought and predictability predictions in endorheic and arid basins. 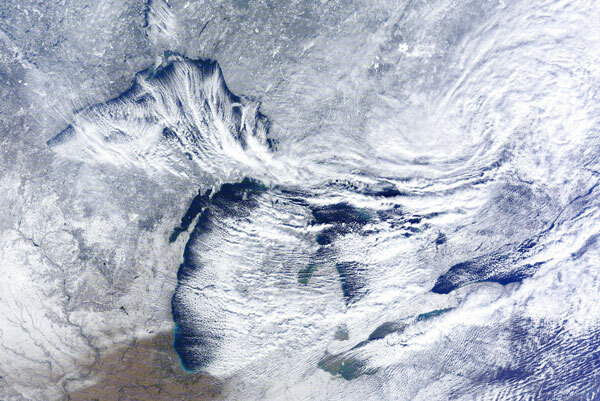 The authors evaluated several algorithms of heat loss and evaporation simulation by comparing with direct measurements at four offshore flux towers in the North American Great Lakes. 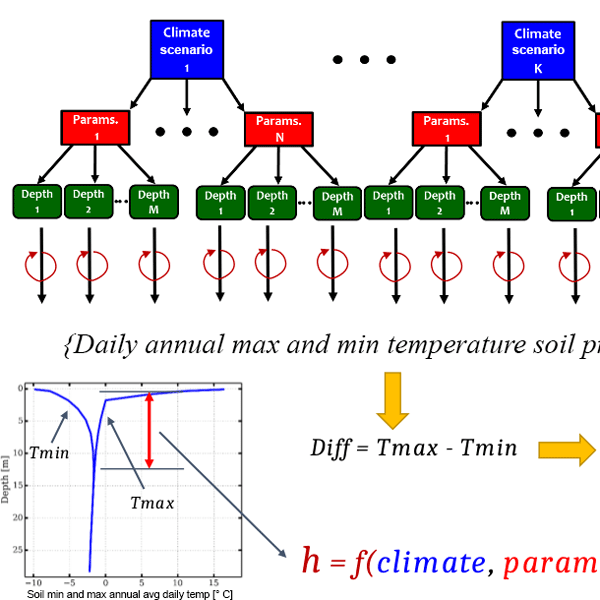 The algorithms reproduced the seasonal cycle of heat loss and evaporation reasonably, but some algorithms significantly overestimated them during fall to early winter. This was due to false assumption of roughness length scales for temperature and humidity and was improved by employing a correct parameterization. In this work we adopted a high-resolution meteorological reanalysis dataset together with a rainfall downscaling algorithm and a rainfall bias correction technique in order to produce input for a hydrological model; the resulting modeling chain allows the production of long time series of distributed hydrological variables in the Liguria region of Italy, located in the northern part of Italy. The aim is to evaluate how such a kind of modeling chain is able to reproduce the hydrology in an area. Precipitation is a key in the water system and glacier fate in the Great Himalayas region. We examine four datasets of available types in the Western Himalayas and they show very large differences. The differences depend much on the data source and are particularly large in monsoon seasons and high-elevation areas. All the datasets show a trend to wetter summer and drier winter and this trend reveals a tendency towards a high-flow seasonality and an unfavorable condition for glaciers. The feasibility of drought prediction is assessed in the Brazilian northeast. The models were provided by a regional agency and a European meteorological agency and downscaling was done using three empirical models. 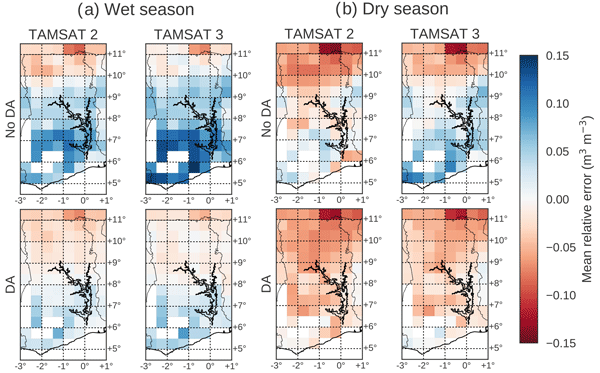 This work showed that the combination of different forecast and downscaling models can provide skillful predictions of drought events on timescales relevant to water managers. But the models also showed little to no skill for quantitative predictions of monthly precipitation. 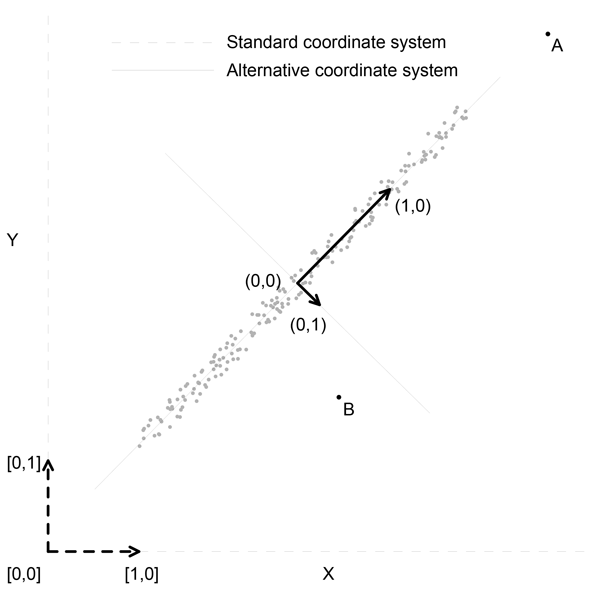 Cross-validation of free-running bias-corrected climate change simulations against observations is misleading, because it is typically dominated by internal variability. In particular, a sensible bias correction may be rejected and a non-sensible bias correction may be accepted. We therefore propose to avoid cross-validation when evaluating bias correction of free-running bias-corrected climate change simulations. Instead, one should evaluate temporal, spatial and process-based aspects. Both radar reflectivity and GTS data are good choices for assimilation in improving high-resolution rainfall of the NWP systems, which always fails in providing satisfactory rainfall products for hydrological use. Simultaneously assimilating GTS and radar data always performs better than assimilating radar data alone. The assimilation efficiency of the GTS data is higher than both radar reflectivity and radial velocity considering the number of data assimilated and its effect. An unprecedented flash drought took place across parts of the US Northern Great Plains and Canadian Prairie Provinces during the summer of 2017 that in some areas was the worst in recorded history. We show that this drought was preceded by a breakdown of land–atmosphere coupling, reducing the likelihood of convective precipitation. It may be useful to monitor land–atmosphere coupling to track and potentially forecast drought development. 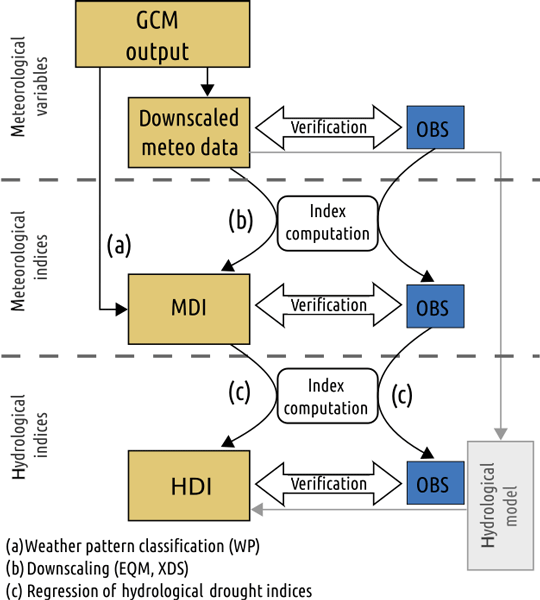 This paper presents the development and skill analysis of WUSHP, a system that makes hydrological forecasts for time horizons up to 7 months. Hot spots of significant skill in river discharge were identified in Fennoscandia (from January to October), the southern part of the Mediterranean (from June to August), Poland, north Germany, Romania and Bulgaria (mainly from November to January), and west France (from December to May). Some skill is left at the end of the forecasts. The effects of WRF domain configurations and spin-up time on rainfall were evaluated at high temporal and spatial scales for simulating an extreme sub-daily heavy rainfall (SDHR) event. Both objective verification metrics and subjective verification were used to identify the likely best set of the configurations. Results show that re-evaluation of these WRF settings is of great importance in improving the accuracy and reliability of the rainfall simulations in the regional SDHR applications. This study aims to bridge the gap between water resources forecasts from the short-range (days) up to the long-range (seasonal) timescale. Applications of such a system are typically the waterpower industry, river and lake transports, and water resources management. The study uses a new meteorological forecast product combined with a hydrological model to predict river discharge over the major European river basins. The results show an improvement in comparison with the current system. Temperature and precipitation can have abnormal states due to climate change and exert a significant impact on the regional hydrologic cycle. 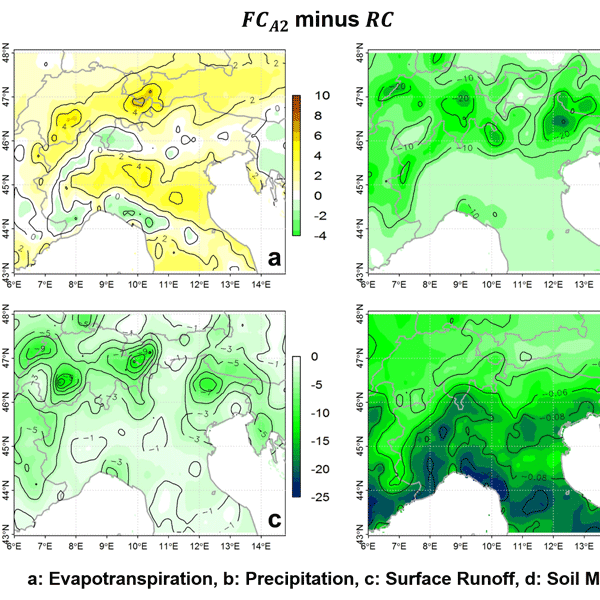 We assess the hydrologic component changes in the Alps and northern Italy, on the basis of regional future climate (FC) conditions, using the UTOPIA land surface model. The annual mean number of dry (wet) days increase remarkably (slightly) in FCs, thus increasing the risk of severe droughts and slightly increasing the risk of floods coincidently. Arctic and subarctic regions are amongst the most susceptible regions on Earth to climate change. There, models require a proper representation of the interactions between climate and hydrology. Typically these model represent the soil with shallow depths, whereas for cold regions, deep soil is needed. To address this, we run model experiments to characterize the effect of soil depth and temperature soil initialization. Our results demonstrate that 20 m of soil profile is essential. Precipitating thunderstorms can occasionally be triggered by the propagation of a front associated with a circulation similar to a land–sea breeze but caused by the contrast of soil patches with different moisture contents. In this study, using an idealized framework, we quantify which fraction of surface rain comes from the contribution of the aforementioned front and which fraction comes from local evaporation. Results show that these two major sources contribute differently. This study presents a multivariate bias correction method named R2D2 to adjust both the 1d-distributions and inter-variable/site dependence structures of climate simulations in a high-dimensional context, while providing some stochasticity. R2D2 is tested on temperature and precipitation reanalyses and illustrated on future simulations. In both cases, R2D2 is able to correct the spatial and physical dependence, opening proper use of climate simulations for impact (e.g. hydrological) models. Canada is very susceptible to recurrent droughts, which have damaging impacts on regional water resources and agriculture. However, nationwide drought assessments are currently lacking and impacted by limited ground-based observations. 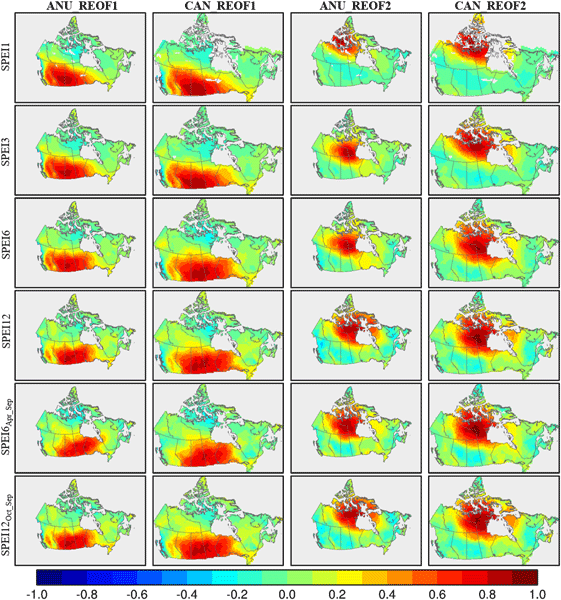 We delineate two major drought regions (Prairies and northern central) over Canada and link drought characteristics to external factors of climate variability. This study helps to determine when the drought events occur, their duration, and how often they occur. An ensemble simulation of five RCMs from CORDEX in East Asia was evaluated and used for future regional climate change projection in China. In addition, the contributions of model uncertainty and internal variability are identified. 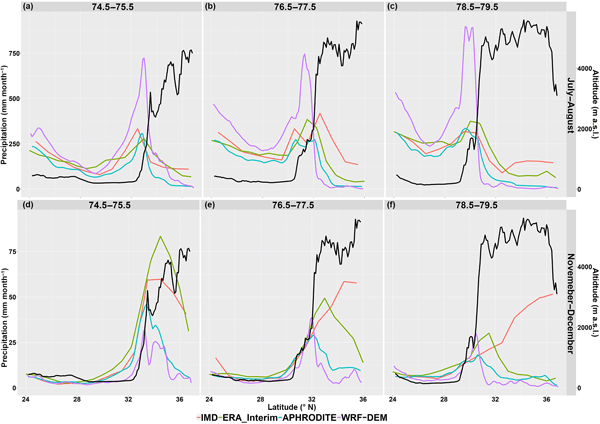 We found that the multi-model ensemble outperforms the individual RCMs in historical climate simulation. The future climate projections show significant inter-RCM differences and the model uncertainty increases with prediction lead time over all subregions. We benchmarked when and where ensemble streamflow prediction (ESP) is skilful in the UK across a diverse set of 314 catchments. 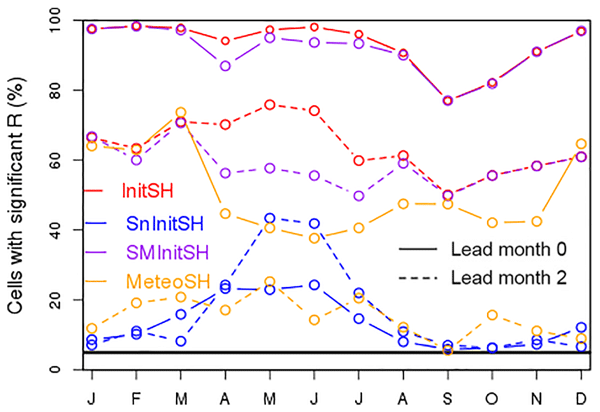 We found ESP was skilful in the majority of catchments across all lead times up to a year ahead, but the degree of skill was strongly conditional on lead time, forecast initialization month, and individual catchment location and storage properties. Results have practical implications for current operational use of the ESP method in the UK. This study analyzes the influence of local and regional meteorological factors on the isotopic composition of precipitation. 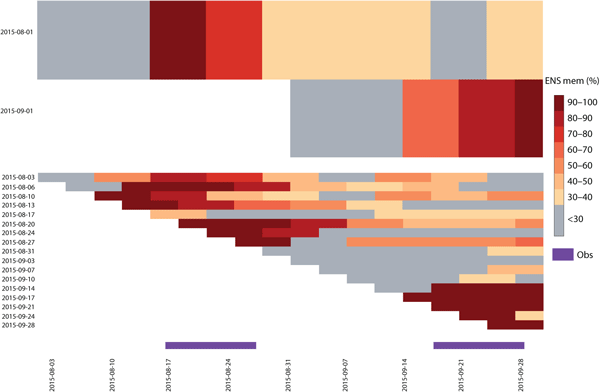 The impact of the different factors on the isotopic condition was quantified by multiple linear regression of all factor combinations combined with relative importance analysis. The proposed approach might open a pathway for the improved reconstruction of paleoclimates based on isotopic records. This article presents predictability analyses of snow accumulation for the upcoming winter season. The results achieved using two coupled atmosphere–ocean general circulation models and a water balance model show that the tendency of snow water equivalent anomalies (i.e. the sign of anomalies) is correctly predicted in up to 11 of 13 years. 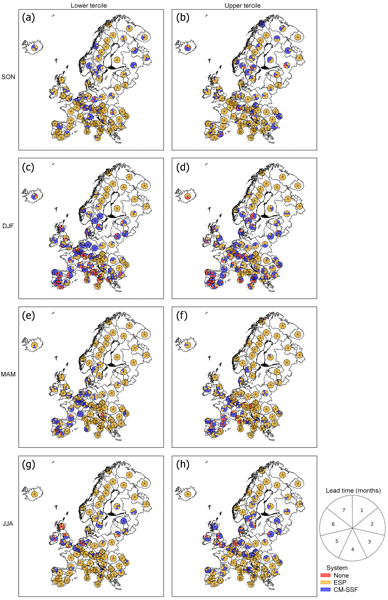 The results suggest that some seasonal predictions may be capable of predicting tendencies of hydrological model storages in parts of Europe. For realistic flood predictions, it is necessary to have accurate rainfall estimates. The Weather Research and Forecasting (WRF) model is often used to correctly simulate heavy rainfall events, but setting up the model over a region is a challenging task. In this study, the sensitivity of the WRF model is assessed for physics schemes, parameterization options, land surface models and downscaling ratios, by simulating several extreme rainfall events in the Ganges basin. Forecasting at the seasonal timescale aims to answer questions such as the following: how much water do we have next summer? Is next winter going to be extremely cold? Constrained by computer power, earth system models (ESMs) do not resolve all environmental variables of interest. Our study tests a method to refine the output of such an ESM for streamflow forecasting in the Rhine basin. 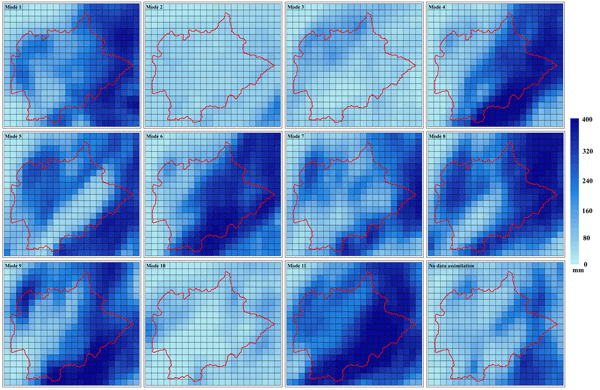 The results show that the method is able to translate skill at different spatial scales. In China, droughts represent a severe threat to socioeconomic development and ecosystems. It is thus necessary to characterize these events in order to reduce and anticipate their impacts. This study proposes an innovative approach for a catchment-wide drought detection and characterization. Two overall drought indicators have been defined and calibrated with real historical events, which have been collected and cataloged. Numerical weather prediction (NWP) models are fundamental for flood early warning, particularly in tropical mountainous watersheds. This paper aims to assess the potential of NWP for flood early warning purposes, and the possible improvement that the post-processing of forecasts can provide, in a tropical mountainous area. The results show the potential of NWP but also the need for more detailed evaluation of the meteorological model in the study area. Here, the first assessment of future changes in extreme precipitation in small Mediterranean watersheds is done through three watersheds frequently subjected to flash floods. Collaboration between Spanish and French laboratories enabled us to conclude that the intensity of high precipitation will increase at the end of the century. A high degree of confidence results from the multi-model approach used here with eight regional climate models (RCMs) developed in the Med and Euro-CORDEX project. 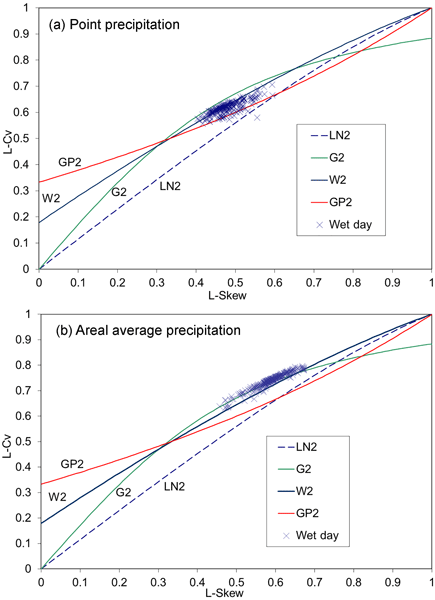 This research paper proposes a multi-site daily precipitation model, named GWEX, which aims to reproduce the statistical features of extremely rare events at different temporal and spatial scales. Recent advances and various statistical methods (regionalization, disaggregation) are considered in order to obtain a robust and appropriate representation of the most extreme precipitation fields. Performances are shown with an application to 105 stations, covering a large region in Switzerland. Assessing the potential impacts of extreme events such as drought and flood requires large datasets of such events, especially when looking at the most severe and rare events. Using a state-of-the-art climate modelling infrastructure that is simulating large numbers of weather time series on volunteers' computers, we generate such a large dataset for the United Kingdom. The dataset covers the recent past (1900–2006) as well as two future time periods (2030s and 2080s). Process prediction of seasonal drought is the goal of our study. We developed a drought prediction model based on atmospheric–oceanic anomalies. It is essentially the synchronous statistical relationship between atmospheric–oceanic anomalies and precipitation anomalies, forced by seasonal climate forecast models. It can predict seasonal drought development very well, despite its weakness in drought severity. Our results showed that adaptations through designing and updating urban drainage systems are effective in coping with urban flood risk under climate change. In the case study region, the magnitude of urban flood risk reduction through adaptations is more than double that by climate mitigations. We emphasize the importance of accounting for both global-scale climate mitigation and local-scale adaptations in assessing future urban flood risks in a consistent frame. Some do not realize the intrinsic importance of water until there is no water left. This is the reality faced by people in southern Peru, a dry area of the world where several economic activities and cities vie for scarce water resources. With the developed season-ahead precipitation prediction model, stakeholders and decision makers in this region will have another tool in their belt to respond to and plan for the negative impacts brought on by drought. This paper evaluates the performance of two commonly used land surface models in simulating deforestation-induced change in surface fluxes using paired FLUXNET observations. Our results highlight the shortcomings in the energy partitioning between latent and sensible heat flux over different land cover types, suggesting the need to improve the representation of surface heat flux processes in land models to increase confidence in LULCC-climate simulations. 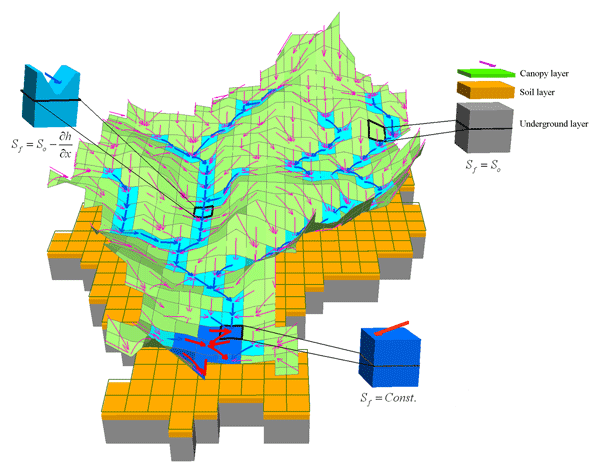 Stochastic rainfall models are required to be be able to assess the reliability of dams used for urban water supply. Traditional Markov chain stochastic models do well at reproducing the mean and variance of rainfall at daily to weekly resolution but fail to simultaneously reproduce the variability of monthly to decadal rainfall. This paper presents four new extensions to Markov chain models that address this decadal deficiency and compares their performance for two field sites. Bromwich, D. H., Nicolas, J. P., Monaghan, A. J., Lazzara, M. A., Keller, L. M., Weidner, G. A., and Wilson, A. B.: Central West Antarctica among the most rapidly warming regions on Earth, Nat. Geosci., 6, 139–145, https://doi.org/10.1038/Ngeo1671, 2013. Chang, J., Li, Y., Wang, Y., and Yuan, M.: Copula-based drought risk assessment combined with an integrated index in the Wei River Basin, China, J. Hydrol., 540, 824–834, https://doi.org/10.1016/j.jhydrol.2016.06.064, 2016. Dai, A. G.: Drought under global warming: a review, Wires Clim. Change, 2, 45–65, https://doi.org/10.1002/wcc.81, 2011. Gitay, H., Suárez, A., Watson, R. T., and Dokken, D. J.: Climate change and biodiversity, IPCC Technical Paper V, IPCC, Geneva, 2002. Hawkins, E., and Sutton, R.: The Potential to Narrow Uncertainty in Regional Climate Predictions, B. Am. Meteorol. Soc., 90, 1095, https://doi.org/10.1175/2009bams2607.1, 2009. IPCC: Climate Change 2013 – The Physical Science Basis, Cambridge University Press, Cambridge, UK and New York, NY, USA, 1535 pp., 2014a. IPCC: Summary for Policymakers, in: Climate Change 2013 – The Physical Science Basis, edited by: Stocker, T. F., Qin, D., Plattner, G.-K., Tignor, M., Allen, S. K., Boschung, J., Nauels, A., Xia, Y., Bex, V., and Midgley, P. M., Cambridge University Press, Cambridge, UK and New York, NY, USA, 1–30, 2014b. IPCC: Long-term Climate Change: Projections, Commitments and Irreversibility, in: Climate Change 2013 – The Physical Science Basis, edited by: Stocker, T. F., Qin, D., Plattner, G.-K., Tignor, M., Allen, S. K., Boschung, J., Nauels, A., Xia, Y., Bex, V., and Midgley, P. M., Cambridge University Press, Cambridge, UK and New York, NY, USA, 1029–1136, 2014c. James, R., Washington, R., Schleussner, C. F., Rogelj, J., and Conway, D.: Characterizing half-a-degree difference: a review of methods for identifying regional climate responses to global warming targets, Wires Clim. Change, 8, e457, https://doi.org/10.1002/wcc.457, 2017. Jiao, Y., Lei, H. M., Yang, D. W., Huang, M. Y., Liu, D. F., and Yuan, X.: Impact of vegetation dynamics on hydrological processes in a semi-arid basin by using a land surface-hydrology coupled model, J. Hydrol., 551, 116–131, https://doi.org/10.1016/j.jhydrol.2017.05.060, 2017. Kormos, P. R., Luce, C. H., Wenger, S. J., and Berghuijs, W. R.: Trends and sensitivities of low streamflow extremes to discharge timing and magnitude in Pacific Northwest mountain streams, Water Resour. Res., 52, 4990–5007, https://doi.org/10.1002/2015wr018125, 2016. Kraaijenbrink, P. D. A., Bierkens, M. F. P., Lutz, A. F., and Immerzeel, W. W.: Impact of a global temperature rise of 1.5 ∘C on Asia's glaciers, Nature, 549, 257–260, https://doi.org/10.1038/nature23878, 2017. Li, H. B., Sheffield, J., and Wood, E. F.: Bias correction of monthly precipitation and temperature fields from Intergovernmental Panel on Climate Change AR4 models using equidistant quantile matching, J. Geophys. Res.-Atmos., 115, D10101, https://doi.org/10.1029/2009jd012882, 2010. Lorenzo-Lacruz, J., Moran-Tejeda, E., Vicente-Serrano, S. M., and Lopez-Moreno, J. I.: Streamflow droughts in the Iberian Peninsula between 1945 and 2005: spatial and temporal patterns, Hydrol. Earth Syst. Sci., 17, 119–134, https://doi.org/10.5194/hess-17-119-2013, 2013. Ma, F., Yuan, X., and Ye, A. Z.: Seasonal drought predictability and forecast skill over China, J. Geophys. Res.-Atmos., 120, 8264–8275, https://doi.org/10.1002/2015jd023185, 2015. Marx, A., Kumar, R., Thober, S., Rakovec, O., Wanders, N., Zink, M., Wood, E. F., Pan, M., Sheffield, J., and Samaniego, L.: Climate change alters low flows in Europe under global warming of 1.5, 2, and 3 ∘C, Hydrol. Earth Syst. Sci., 22, 1017–1032, https://doi.org/10.5194/hess-22-1017-2018, 2018. McVicar, T. R., Roderick, M. L., Donohue, R. J., Li, L. T., Van Niel, T. G., Thomas, A., Grieser, J., Jhajharia, D., Himri, Y., Mahowald, N. M., Mescherskaya, A. V., Kruger, A. C., Rehman, S., and Dinpashoh, Y.: Global review and synthesis of trends in observed terrestrial near-surface wind speeds: Implications for evaporation, J. Hydrol., 416, 182–205, https://doi.org/10.1016/j.jhydrol.2011.10.024, 2012. Mo, X. G., Liu, S. X., Chen, D., Lin, Z. H., Guo, R. P., and Wang, K.: Grid-size effects on estimation of evapotranspiration and gross primary production over a large Loess Plateau basin, China, Hydrolog. Sci. J., 54, 160–173, https://doi.org/10.1623/hysj.54.1.160, 2009. Mohammed, K., Islam, A. S., Islam, G. M. T., Alfieri, L., Bala, S. K., and Khan, M. J. U.: Extreme flows and water availability of the Brahmaputra River under 1.5 and 2 ∘C global warming scenarios, Climatic Change, 145, 159–175, https://doi.org/10.1007/s10584-017-2073-2, 2017. 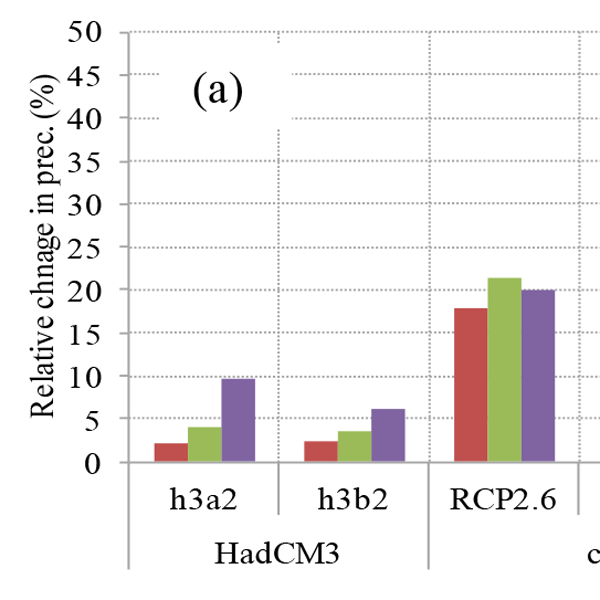 Orlowsky, B. and Seneviratne, S. I.: Elusive drought: uncertainty in observed trends and short- and long-term CMIP5 projections, Hydrol. Earth Syst. Sci., 17, 1765–1781, https://doi.org/10.5194/hess-17-1765-2013, 2013. Parajka, J., Blaschke, A. P., Bloeschl, G., Haslinger, K., Hepp, G., Laaha, G., Schoener, W., Trautvetter, H., Viglione, A., and Zessner, M.: Uncertainty contributions to low-flow projections in Austria, Hydrol. Earth Syst. Sci., 20, 2085–2101, https://doi.org/10.5194/hess-20-2085-2016, 2016. 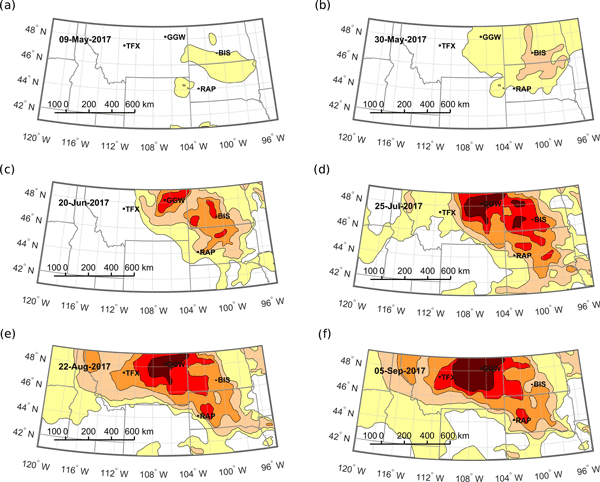 Perez, G. A. C., van Huijgevoort, M. H. J., Voss, F., and van Lanen, H. A. J.: On the spatio-temporal analysis of hydrological droughts from global hydrological models, Hydrol. Earth Syst. Sci., 15, 2963–2978, https://doi.org/10.5194/hess-15-2963-2011, 2011. Peters, G. P., Andrew, R. M., Boden, T., Canadell, J. G., Ciais, P., Le Quéré, C., Marland, G., Raupach, M. R., and Wilson, C.: The challenge to keep global warming below 2 ∘C, Nat. Clim. Change, 3, 4–6, 2012. Piao, S. L., Ito, A., Li, S. G., Huang, Y., Ciais, P., Wang, X. H., Peng, S. S., Nan, H. J., Zhao, C., Ahlstrom, A., Andres, R. J., Chevallier, F., Fang, J. Y., Hartmann, J., Huntingford, C., Jeong, S., Levis, S., Levy, P. E., Li, J. S., Lomas, M. R., Mao, J. F., Mayorga, E., Mohammat, A., Muraoka, H., Peng, C. H., Peylin, P., Poulter, B., Shen, Z. H., Shi, X., Sitch, S., Tao, S., Tian, H. Q., Wu, X. P., Xu, M., Yu, G. R., Viovy, N., Zaehle, S., Zeng, N., and Zhu, B.: The carbon budget of terrestrial ecosystems in East Asia over the last two decades, Biogeosciences, 9, 3571–3586, https://doi.org/10.5194/bg-9-3571-2012, 2012. Rogelj, J., Luderer, G., Pietzcker, R. C., Kriegler, E., Schaeffer, M., Krey, V., and Riahi, K.: Energy system transformations for limiting end-of-century warming to below 1.5 ∘C, Nat. Clim. Change, 5, 519–527, https://doi.org/10.1038/nclimate2572, 2015. 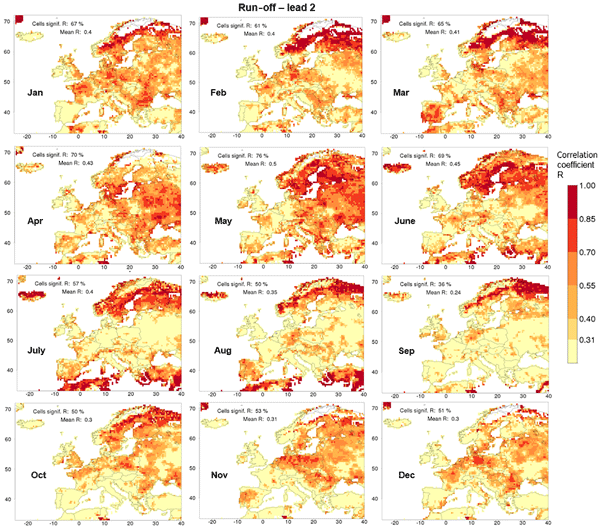 Roudier, P., Andersson, J. C. M., Donnelly, C., Feyen, L., Greuell, W., and Ludwig, F.: Projections of future floods and hydrological droughts in Europe under +2 ∘C global warming, Climatic Change, 135, 341–355, https://doi.org/10.1007/s10584-015-1570-4, 2016. Samaniego, L., Thober, S., Kumar, R., Wanders, N., Rakovec, O., Pan, M., Zink, M., Sheffield, J., Wood, E., and Marx, A.: Anthropogenic warming exacerbates European soil moisture droughts, Nat. Clim. Change, 8, 421–426, https://doi.org/10.1038/s41558-018-0138-5, 2018. 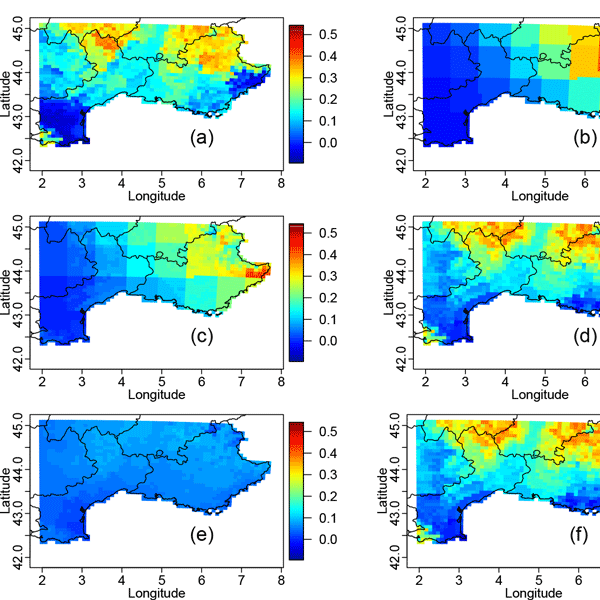 Shen, Y., Zhao, P., Pan, Y., and Yu, J. J.: A high spatiotemporal gauge-satellite merged precipitation analysis over China, J. Geophys. Res.-Atmos., 119, 3063–3075, https://doi.org/10.1002/2013JD020686, 2014. Sheng, M. Y., Lei, H. M., Jiao, Y., and Yang, D. W.: Evaluation of the Runoff and River Routing Schemes in the Community Land Model of the Yellow River Basin, J. Adv. Model. Earth Syst., 9, 2993–3018, https://doi.org/10.1002/2017ms001026, 2017. 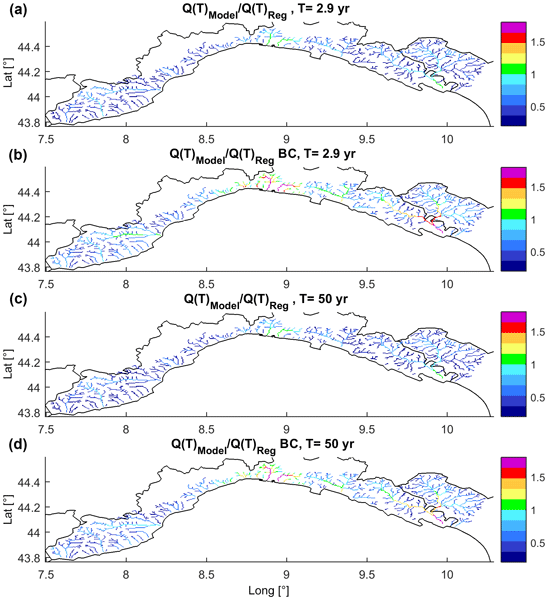 Tang, Y., Tang, Q., Tian, F., Zhang, Z., and Liu, G.: Responses of natural runoff to recent climatic variations in the Yellow River basin, China, Hydrol. Earth Syst. Sci., 17, 4471–4480, https://doi.org/10.5194/hess-17-4471-2013, 2013. Thornton, P. K., Ericksen, P. J., Herrero, M., and Challinor, A. J.: Climate variability and vulnerability to climate change: a review, Global Change Biol., 20, 3313–3328, https://doi.org/10.1111/gcb.12581, 2014. Tirado, M. C., Clarke, R., Jaykus, L. A., McQuatters-Gollop, A., and Franke, J. M.: Climate change and food safety: A review, Food Res. Int., 43, 1745–1765, https://doi.org/10.1016/j.foodres.2010.07.003, 2010. Van Loon, A. F., Stahl, K., Di Baldassarre, G., Clark, J., Rangecroft, S., Wanders, N., Gleeson, T., Van Dijk, A. I. J. M., Tallaksen, L. M., Hannaford, J., Uijlenhoet, R., Teuling, A. J., Hannah, D. M., Sheffield, J., Svoboda, M., Verbeiren, B., Wagener, T., and Van Lanen, H. A. J.: Drought in a human-modified world: reframing drought definitions, understanding, and analysis approaches, Hydrol. Earth Syst. Sci., 20, 3631–3650, https://doi.org/10.5194/hess-20-3631-2016, 2016. Vicente-Serrano, S. M., Lopez-Moreno, J. I., Begueria, S., Lorenzo-Lacruz, J., Azorin-Molina, C., and Moran-Tejeda, E.: Accurate Computation of a Streamflow Drought Index, J. Hydrol. Eng., 17, 318–332, https://doi.org/10.1061/(Asce)He.1943-5584.0000433, 2012. Vorosmarty, C. J., Green, P., Salisbury, J., and Lammers, R. B.: Global water resources: Vulnerability from climate change and population growth, Science, 289, 284–288, https://doi.org/10.1126/science.289.5477.284, 2000. Wanders, N. and Wada, Y.: Human and climate impacts on the 21st century hydrological drought, J. Hydrol., 526, 208–220, https://doi.org/10.1016/j.jhydrol.2014.10.047, 2015. Wood, A. W., Maurer, E. P., Kumar, A., and Lettenmaier, D. P.: Long-range experimental hydrologic forecasting for the eastern United States, J. Geophys. Res.-Atmos., 107, 4429, https://doi.org/10.1029/2001jd000659, 2002. Xiao, J. F.: Satellite evidence for significant biophysical consequences of the “Grain for Green” Program on the Loess Plateau in China, J. Geophys. Res.-Biogeo., 119, 2261–2275, https://doi.org/10.1002/2014jg002820, 2014. Xu, J. X.: Variation in annual runoff of the Wudinghe River as influenced by climate change and human activity, Quatern. Int., 244, 230–237, https://doi.org/10.1016/j.quaint.2010.09.014, 2011. Yuan, X. and Wood, E. F.: Multimodel seasonal forecasting of global drought onset, Geophys. Res. Lett., 40, 4900–4905, https://doi.org/10.1002/grl.50949, 2013. 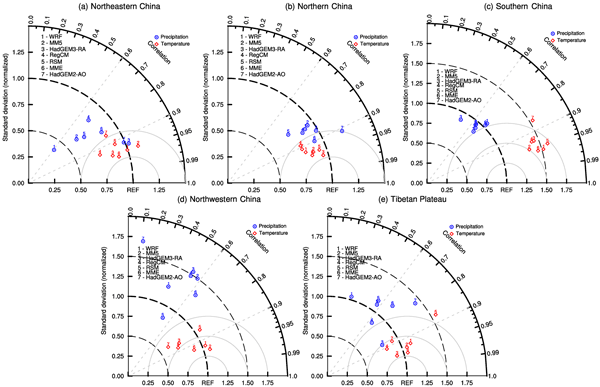 Yuan, X., Roundy, J. K., Wood, E. F., and Sheffield, J.: Seasonal forecasting of global hydrologic extremes: system development and evaluation over GEWEX basins, B. Am. Meteorol. Soc., 96, 1895–1912, https://doi.org/10.1175/BAMS-D-14-00003.1, 2015. Yuan, X., Zhang, M., Wang, L. Y., and Zhou, T.: Understanding and seasonal forecasting of hydrological drought in the Anthropocene, Hydrol. Earth Syst. Sci., 21, 5477–5492, https://doi.org/10.5194/hess-21-5477-2017, 2017. Yuan, X., Jiao, Y., Yang, D., and Lei, H.: Reconciling the attribution of changes in streamflow extremes from a hydroclimate perspective, Water Resour. Res., 54, 3886–3895, https://doi.org/10.1029/2018WR022714, 2018. Zhang, X. P., Zhang, L., Zhao, J., Rustomji, P., and Hairsine, P.: Responses of streamflow to changes in climate and land use/cover in the Loess Plateau, China, Water Resour. Res., 44, W00A07, https://doi.org/10.1029/2007wr006711, 2008. Zhao, G. J., Tian, P., Mu, X. M., Jiao, J. Y., Wang, F., and Gao, P.: Quantifying the impact of climate variability and human activities on streamflow in the middle reaches of the Yellow River basin, China, J. Hydrol., 519, 387–398, https://doi.org/10.1016/j.jhydrol.2014.07.014, 2014. Zheng, H. X., Zhang, L., Zhu, R. R., Liu, C. M., Sato, Y., and Fukushima, Y.: Responses of streamflow to climate and land surface change in the headwaters of the Yellow River Basin, Water Resour. Res., 45, W00A19, https://doi.org/10.1029/2007wr006665, 2009. Zhu, Z. C., Piao, S. L., Myneni, R. B., Huang, M. T., Zeng, Z. Z., Canadell, J. G., Ciais, P., Sitch, S., Friedlingstein, P., Arneth, A., Cao, C. X., Cheng, L., Kato, E., Koven, C., Li, Y., Lian, X., Liu, Y. W., Liu, R. G., Mao, J. F., Pan, Y. Z., Peng, S. S., Penuelas, J., Poulter, B., Pugh, T. A. M., Stocker, B. D., Viovy, N., Wang, X. H., Wang, Y. P., Xiao, Z. Q., Yang, H., Zaehle, S., and Zeng, N.: Greening of the Earth and its drivers, Nat. Clim. Change, 6, 791–795, https://doi.org/10.1038/nclimate3004, 2016. This paper projects future changes in drought characteristics under different warming levels over a semiarid watershed based on hydroclimate simulations. Despite large uncertainties from climate models, we find that less frequent but more severe hydrological drought events would occur in the near future, suggesting that different aspects of hydrological droughts should be carefully investigated when assessing the impact of global warming.